Simbambili is known for being in an area with the highest concentration of leopards in the world! Wonderful private deck areas including your own plunge pools and inviting salas – perfect for chilling during the day! No kids under 12 allowed – but leave the sprogs with their best friends for the weekend and spoil yourselves instead for a change! 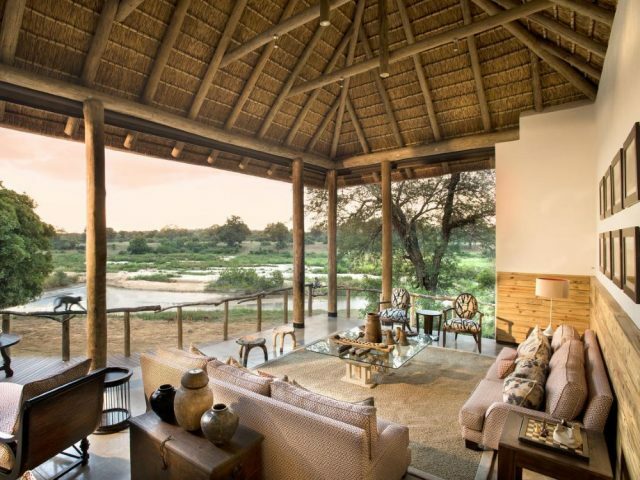 the highlight for us though were the spacious and very private deck areas overlooking the river bed and waterhole – we spent hours during the heat of the day just relaxing here in our private plunge pool! 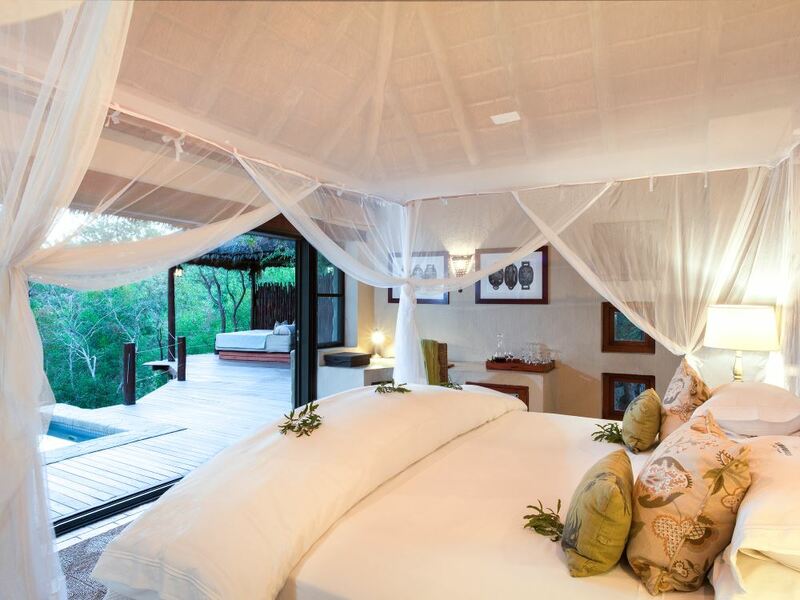 Simbambili Lodge is situated among dense stands of knobthorn and jackalberry trees along the winding perennial Manyeleti River in the northern section of the exclusive Sabi-Sands reserve. This reserve is the best area in the world to see leopards bar none – and Simbambili certainly won’t disappoint in that regard. When we stayed at the lodge we spotted 3 different leopards within the first hour and a half of our first game drive! In fact, by the end of our stay we were joking that leopard were so common here that they were “the new impala”! 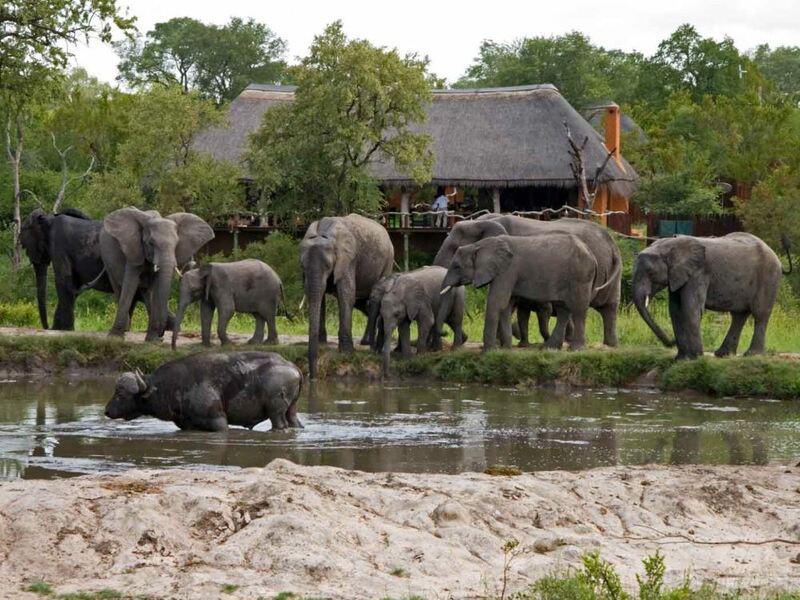 The lodge is home to 7 suites and 1 waterhole suite (which includes a private lounge area) - all of which are decked out attractively in neutral colours. These air-conditioned Moroccan-styled suites may not be quite as spacious and luxurious as some of their much more expensively priced competitors, but they really are very comfortable indeed and all but the most demanding of guests will be delighted with their accommodation. Quite an unusual feature is that the bathrooms with their lovely standalone baths and open shower enjoy an indoor/outdoor location, technically inside the room and under cover but once you open up the expansive glass doors they also give a wonderful feeling of being open to your surroundings. If you can drag yourself away from your private deck, the public area is beautifully decorated and is a delightful place to sit and watch the animals gather at the nearby watering hole – or you could curl up on the couch and read a book from the library. In the cold of winter the lounge area has two roaring fireplaces on both ends, ensuring that you avoid the chill and stay warm and cosy! 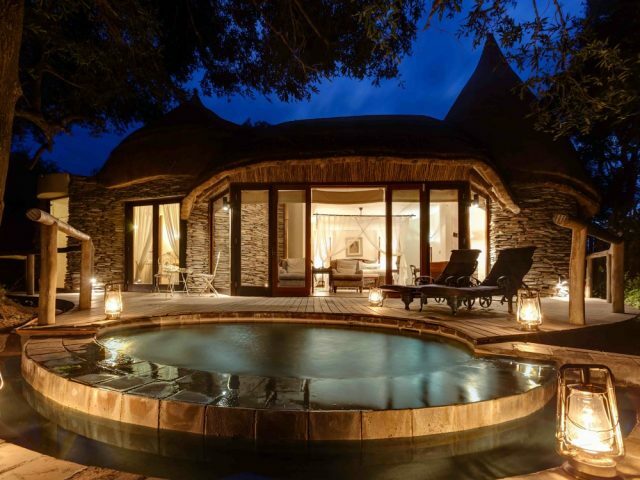 At night after a great dinner - served perhaps in the boma, perhaps at the lodge – it’s the perfect place to socialize with other guests over a cognac or a cigar where you can compare war stories about the day’s adventures before heading to bed to rest up for the next morning’s game drive. Whilst Simbambili is famed for its fantastic leopard sightings, that’s not all that it’s good for – there’s an abundance of general game species as well as extraordinary bird life. One thing to note though is that you’re not as likely to see as many lions as you would expect in the Timbavati for instance (leopards and lions are major competitors so the presence of many leopards is possible because the lion population is not too high) Your day starts as dawn breaks over the bush – here you will depart on your first game drive of the day in an open 4x4 with an experienced ranger and Shangaan tracker who will blow you away with their extensive knowledge of the bush along with tales of traditional folklore. Sometimes you may be invited out of the vehicle to see animal tracks, examine certain plants and to follow spoor – this is especially exciting as you can see what the animals have been up to during the night whilst never being entirely sure what lies around the corner or behind that thicket of trees!Then it’s time for a scrumptious breakfast, either back at the lodge or perhaps in the bush or on a sandy riverbed. After stuffing yourself with your delicious breakfast/brunch (it’s amazing how you always tend to stuff yourself in the bush!) you then have the rest of the day to laze about. Or perhaps you may be the more active type that then chooses to head out with your ranger and tracker again for a bush walk when they can give you greater insight into the fauna and flora of the area, in particular the smaller animals usually unnoticed in your 4x4. 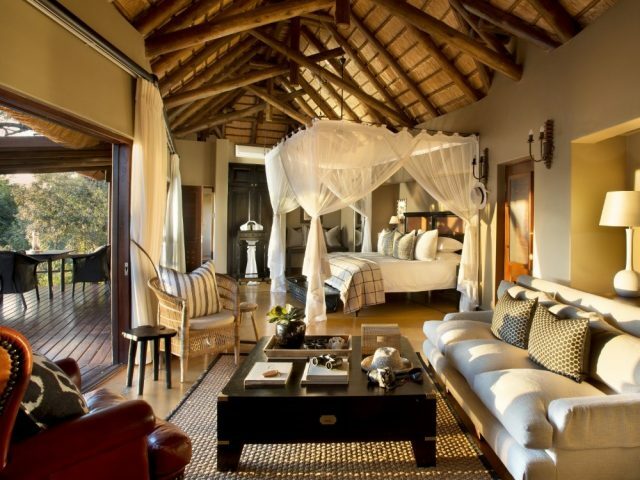 Our choice probably though, would be to head to the Spa for a relaxing massage before tackling a decent novel in the comfort of your sala – after all, being in the bush is ultimately all about relaxing and de-stressing!